In his book, Sagarin argues that our national security organizations are broken. Though the people in those institutions are well-meaning, often they're asked to deal with novel threats using methods that haven't worked for decades. That problem inspired Sagarin to "learn from success" in evolutionary biology, taking security lessons from species that have survived for thousands of years in extremely threatening environments. He's refined his ideas by talking with first responders, soldiers, and teams of doctors deployed to deal with emerging disease threats. The three main takeaway lessons for "natural security" are that survival depends on redundancy, decentralization, and symbiosis. But can we really build security organizations that are redundant, decentralized, and form symbiotic relationships with seemingly incompatible groups? Here's what Sagarin had to say. 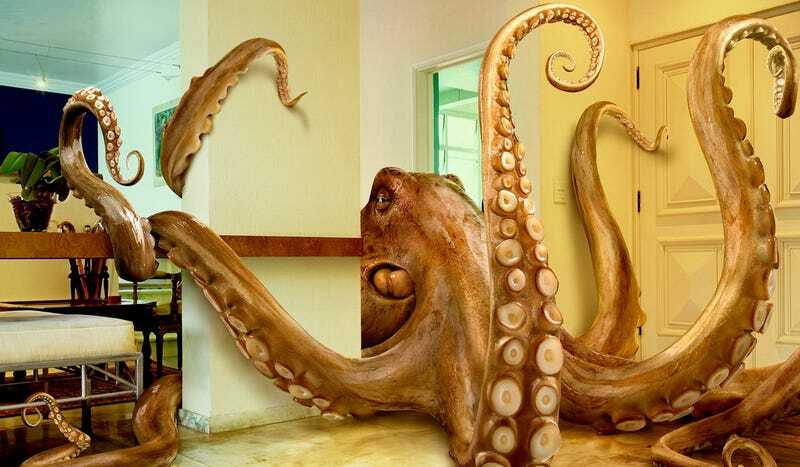 io9: Why is the octopus a good model for national security? Rafe Sagarin: we've been insulated from the daily struggle to survive that imparts adaptability onto an organism. I'm not talking about making a direct translation from nature to society. Every translation from science to policy goes through filters - ethical and political ones. There is a lot of death and dismemberment in nature that we want to avoid if we're developing similar adaptable systems! The octopus has so many natural adaptations all in one package. It has adaptable features that are almost automatic and distributed and just happen - like the way its skin cells respond to the environment to create camouflage. Its remarkably like us, too. It has a cognitive thoughtful side that allows it to plan and be strategic about things. We as a species and society have the ability to use both those sides of adaptability - distributed quick response through independent agents [like the octopus' skin cells] and the ability that we overuse to centralize and plan and develop strategy. What I'm suggesting is that we need to push more toward the decentralized adaptability that we've lost touch with. We shouldn't be like cells, but we can use that distributed ability for many humans to come up with many observations and solutions to problems in the world. One way we can activate that is to switch from small groups of experts giving orders, to identifying critical challenges and asking everyone to help solve. We want take in the best lessons from most adaptable organisms. io9: So are the species that survive the longest good models? RS: Longevity is not best metric. There are species that have been around for longer than octopuses and humans, like deep sea brachiopods, that are basically unchanged - they've established a niche and they do fine. But we want to think about how can we not just survive, but thrive. Octopuses are doing new adaptations. For example, there's a video on YouTube you can watch where you'll see an octopus figuring out how to use a coconut as camouflage. We'd like to see organizations that are dynamic and diversifying. Beetles have taken multiple walking legs and diversified them - they now have wings, chemical weapons, and antenna, as well as walking legs. Evolution teaches us to diversify. io9: It seems like your book is about a radically new kind of security, one that's oriented around long term survival. What does this kind of security look like? RS: It's really about being in the sweet spot between reacting to something in the past and preparing for an unpredictable future. We spend so much time trying to predict what the next threat is. But we need to get that sweet spot where you have the observational ability to notice change as soon as possible and respond to it. We also need multiple ways to respond. To do that, we need to be really good sensors of the environment, and then have multiple redundant ways to solve problems. There's no ideal way to do this - that's one of the things I point out all the time. You have to ask, "What are our threats and vulnerabilities and what are best solutions?" Most likely, the people who have been solving these threats so far aren't the right ones for future solutions. To create an adaptable organization, you'd want to establish connections from the start, channels of communication. You want to upregulate channels and communicate quickly. You only need a basic architecture to make that happen, some way to know that when you get a signal, you can respond yourself — our immune system can do that without much connection to our brains. But in other cases, for example, if we have to move to get away from a threat then nerves have to be connected to a brain that can direct us to move. So the structure depends on the nature of the threat. Hackers can't deal with a tsunami - they need to be connected with another organization that can deal with it. So you need symbiosis too. Technology is allowing us now to evolve into an incredibly adaptable species. We can develop cheap networked sensors that can be used in remote areas to identify disease outbreaks. We have new observational capabilities through symbiosis. You don't have to change the whole organization to become adaptable. We don't need to take down organizations and build them up again. At any given time there are only parts needed to solve a problem. So if you meet these challenges in your own little part and they are successful, you replicate those — you learn from success like in natural systems. You can do that stealthily for the first few challenges, then by the time that it gets attention up and down the food chain you have this record of success. I do my teaching like this now. Using a syllabus as a top down form of organization is ineffective. I've ripped up the syllabus and have students work with me to create the structure of the class. I can't do that openly to start — they want me to have this syllabus. But now that I've run classes like this through several iterations, I can start to take off that veil — this is the way a virus might inculcate into larger organism. There's a manner of cloaking to avoid immediate immune response, but once it's successful it proliferates. Now other departments want to do it too. I don't care if it doesn't spread to the entire organization - it just needs to spread to places where people are making important decisions at that particular time. io9: Have you had good responses to these ideas from people dealing with security on the ground? RS: I've had a tremendously good response from first responders and military that I've spoken to. Basically anybody who has spent time in the field, in combat, or on the front lines of disaster or medical response — they all get it. They love it because they can bring it back to the desk bound bureaucrats. They'll say, "This is what we were doing for 10 years in Iraq on the ground — we were adapting to observe and respond and we're back in the Pentagon now and we want to maintain that adaptable capacity." This book is a guide and backbone to stand on. We have a generation of young officers and soliders coming back from conflicts who have learned to be adaptable and we need to facilitate continued adaptability, instead of insulating them. Let them teach us. Nature laughs in the face of any excuse you make about not being adaptable. We've been adaptable for most of our time on Earth. We need to continue this process of adaptation to deal with uncertainty, without planning everything and trying to be perfect. We just waste resources when we try to do that. Pick up a copy of Sagarin's book via Amazon.